Nokia 7.1 Hands-on: The Next Budget Phone Champ? No, this isn’t the wild bug-eyed Nokia phone with five rear cameras we’ve been hoping to see, but it’s something arguably just as important. That’s because the new Nokia 7.1 is simply a well-built phone with solid specs for a very reasonable price. Priced at $350, the Nokia 7.1 looks to continue HMD’s recent success after the young Finnish company bought the rights to the Nokia name in late 2016, and in just two years, has quickly become a top 10 handset vendor with over 4.5 million phones sold in Q2 2018. The Nokia 7.1's two color options: midnight blue and gloss steel. For the 7.1, Nokia/HMD’s game plan couldn’t be more straightforward. Since the 7.1 is part of the Android One program, you get a no frills, no bloat installation of Android with regular security and software updates managed by Google. And while the phone will come with Android 8.1 Oreo when the phone launches on October 28th, HMD says the 7.1 should get upgraded to Android 9 Pie before the end of November. As for the specs, you’ll get a mid-range Qualcomm Snapdragon 636 chipset, 4GB of RAM, 64GB of storage, 3,060 mAh battery, and a built-in microSD card slot. And unlike a lot of more expensive phones nowadays, the 7.1 features both USB-C and a headphone jack. However, the 7.1 isn’t completely without premium aspirations as the phone’s 5.8-inch FHD+ LCD screen includes support for HDR 10, along with the ability to convert standard content into slightly brighter and more colorful pseudo-HDR images automatically. HMD has also enhanced the company’s ridiculously named “bothie” feature that lets you take pictures using the 8-MP front cam and 12-MP/5-MP rear cameras at the same time. Now, instead of needing to effectively frame up two pictures at the same time, you can shoot a bothie using one camera at a time and then combine them together at the end. I’m not big into selfies, but if you want to take create photos with images from both front and rear cameras, it’s even easier on the 7.1. But that’s just some fun fluff, because what’s probably the best thing about the 7.1 is its build. Crafted from a frame made out of extruded aircraft grade aluminum and various hardened glass on front and back (the front panel is Gorilla Glass 3), the 7.1 feels hefty and substantial in a way that a lot of budget/midrange handsets don’t. HMD has also added some nice detailing via thin strips of inlaid metal that provide a welcome contrast between the 7.1's two color options (midnight blue and gloss steel). USB-C on the bottom, and a headphone jack on top. Nice. So while the 7.1 might not be as exciting as a phone crammed with extra cameras, it might be the exact kind of device we need in a time when high-end phones are regularly hitting the $1,000 mark. 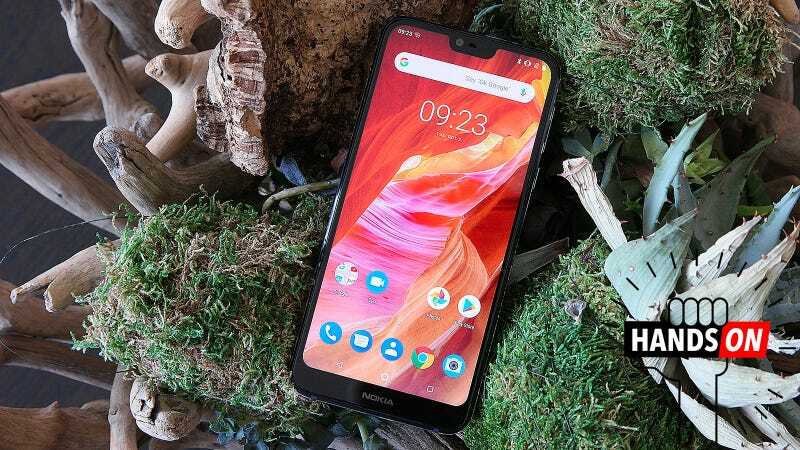 And if the Nokia 7.1 offers the same kind of build and performance as it demonstrated in my brief time checking out a handful of pre-production handset, we could be looking at a new budget smartphone champ.